Discussion in 'Help & Advice' started by Axton, Apr 15, 2019 at 5:58 PM. I just started yesterday and I'm lv33 now, I heard that there should have been a lightbulb at lv30 that gives me an empty compass to use with the N.E.W.S alphabets, but I didn't get any empty compass. I have around 60 of each alphabets, tried relogging in as well, can't think of any other solutions, any advice on this? PS. A side question, I saw the event poster and where do I find mad bunny / gold richie / do the moon jump quest? 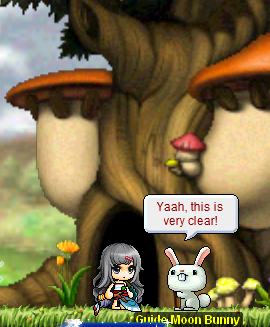 If you want to do the Mad Bunny Quest the NPC will be in the middle of the map after you've entered. can the compass quest just be done once? or once daily? Is it me or Moon Bunny crystals don't drop? To avoid making a new thread, I’m going to ask my easter event question here. How do you get the currency for the chairs? From the salesman? Doing the Rescue Gaga JQ gets you 1 lucky coin. Repeatable twice per day for up to 2 coins per day.